Back in July 2009, I wrote about a bat that makes its home in the rock cliff above our home. Recently, we've been having some interesting experiences with bats again, and I decided I'd better do some research. The other night, a bat started flying up against our bedroom window — not so much smashing into the window like a bird would, but smushing up against the window like a moth does when seeking the light. But this was no moth! It happened about 8 times. We were quite stupefied. Even without getting all "woowoo" about this event as a possible message or portent, it simply didn't seem right. For the next two days, bats kept getting mentioned in books and articles or conversations. "Okay, okay, I get the message." "It's beyond shocking," David Phillips, a senior climatologist with Environment Canada, told Canwest News Tuesday. Records have been shattered from "coast to coast to coast." "It is truly a remarkable situation," says Phillips, noting that he's seen nothing like it in his 40 years of weather watching. He also warns that "the winter that wasn't" may have set the stage for potentially "horrific" water shortages, insect infestations and wildfires this summer. Then I looked up bats. Seems they wake up in April. It's still early March. If I were a bat, I'd be knocking at somebody's window, too. "... [B]ats are dying from starvation and weakened immune systems resulting from the unusually warm late fall and winters during the last several years, which has kept bats flying even when fewer insects are available to eat. "That has led bats to begin hibernation with insufficient fat reserves, prompting them to starve and sometimes leave the safety of caves in search of food during cold weather, which is usually fatal." 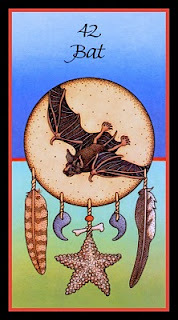 I love the connection to the Medicine Card with Bat! Those cards have been a great inspiration to my song writing and I like the connection you have made to it being time we get going with renewable energy! My Bat song would go well with this Post! Hope you are well and enjoying Spring! Rosie, your music is always so fun and uplifting! You're right, your song "Bats, Bats, Bats" would go very well with this post! Imagine yourself up in space, floating around peacefully in your space suit. No noise, no neighbours, nothing to do but relax. There's nothing there so there's nothing to worry about. Right? Wrong. What will you drink? Where will fresh water come from? What will you eat? How will you grow food up there? Where will your clothing come from once your space suit wears out? What about oxygen, once your tank runs out? What will you do when you're finished relaxing and get bored? No trees = no books. No millions of years of life forms = no oil = no plastics for entertainment technology. Just think of all the different things we rely on constantly. We humans cannot live without a diversity of biological entities to support us. We need biodiversity. Without it, we cannot "be" human beings. p.s. Very sad to hear about the manatees. Many people forget that global warming leads to climate disruption and climate chaos, and it sounds like these gentle giants are especially vulnerable.